A fun retelling/revisiting the legend of The Rutles and their trousers. THE RUTLES 2: CAN’T BUY ME LUNCH is pieced together from outtakes of THE RUTLES (1978) and new talking head footage compiled by Eric Idle. And it shows. Playing his same Interviewer character from the previous film 26 years ago, a lot of the sheen is missing from this rehashing of old jokes and new jokes that are simply old jokes in different trousers. And because we only see “old footage” of the actual band The Rutles (i.e. footage from the first film) – and are not graced with new interviews from them – this sequel mockumentary lacks the vitality of the original. 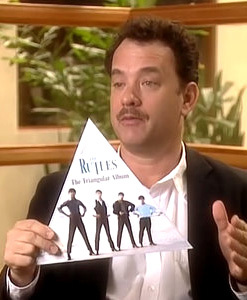 In this straight-to-DVD release, Interviewer examines Rutlemania in retrospect, so intercuts quick snippets of The Rutles (mostly B-roll from THE RUTLES) with a galaxyload of power players to impress us with how seriously they can act like this is real. Tom Hanks and the shape of desperation. We see snippets of the old classic Rutles songs (I Must Be In Love, Number One, With A Girl Like You), plus hear a plethora of “new” songs; i.e. 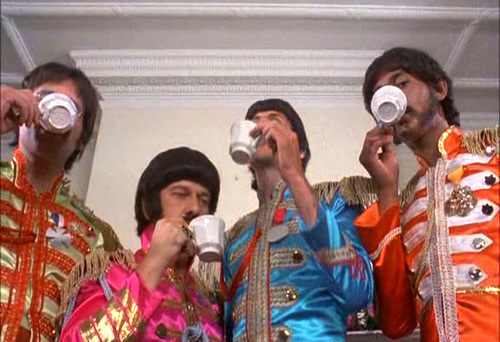 songs that were recorded at the time of the original RUTLES, but omitted from that film because they were not quite as recognizable or catchy as the ones included. Why they were omitted speaks for itself upon hearing them. And the individual band members’ histories are slightly rewritten, I presume for the sake of not repeating old jokes. Which are repeated anyway. I wouldn’t call this project cynical or avaricious or even egotistical on Eric’s part. (Uhh, does that mean I just called it all that?) I just think Idle had more ideas lying around for THE RUTLES than he knew what to do with; he probably took into account how many favors he could pull as a Python, and presto! – a DVD release that might make some bank in the wake of the actual Beatles Anthology (released on DVD in 2003, first broadcast 1995). I’m not gonna get the knives (or the dirty forks) out for this film – it’s fun, and there are definitely a few laughs, tempered of course by the fact that it might be cynical, avaricious and egotistical. Starring: Eric Idle, Neil Innes, John Halsey, Ricky Fataar, Conan O’Brien, Billy Connolly, Bonnie Raitt, Tom Hanks, Robin Williams, Steve Martin, Garry Shandling, Carrie Fisher, Jann Wenner, Clint Black, Jimmy Fallon, David Bowie, Catherine O’Hara, Graham Nash, Mike Nichols, James Taylor, Salman Rushdie. By the time of this 2004 DVD, The Rutles – like Spinal Tap – had become a “real act” (i.e. an act that could get booked on the strength of its own name). Through constant cameos over the years, various record releases and guest spots, this Beatles parody band was actually selling tickets as a “real” live band (almost in the vein of a Beatles tribute, but with that added twist of originality/pastiche). Neil Innes would always helm a revolving door of members that many times included his bandmates from the film, John Halsey (Barry/Ringo) and Ricky Fataar (Stig/George). So it was not such a poke in the eye that Idle did not involve them in THE RUTLES 2. They were busy, ironically, as The Rutles!